The Summarize & Analyze dialog is a one stop dialog for creating and filling in summary records based on pre-selected criteria. In the dialog you specify how you want the database to be divided into groups, what calculations you want performed, and what level of detail you want to see. Once set up, press one button and all the necessary operations are performed. (You can also perform these operations as separate steps, see Generating Summaries Manually). Here is the basic layout of this dialog. This dialog looks complicated, but to perform a single level analysis all you have to do is choose the field you want to divide into groups, and the field you want to total. Then simply press the Analyze Data button and all of the Summary Records will be created and filled in for you, and the summary outline collapsed to hide the raw detail and show only the summaries (see Expanding and Collapsing the Summary Outline). 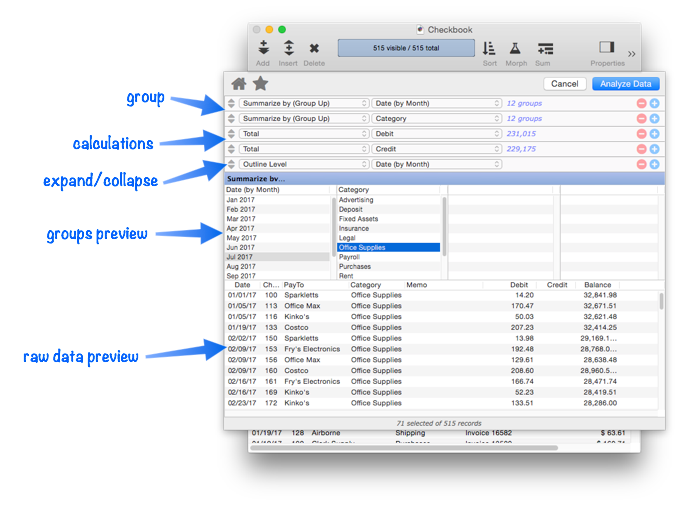 Panorama can create up to seven nested summary levels, for example Categories within Months, or Cities within States within Months within Years. To add an addi- tional summary level, re-open the Summarize & Analyze dialog, then press the + button on the first row to add a second summary level. Once the row is added, select the field you want to sub-group by. You’ll also now have the choice of what level of summary to display by default. (Of course you can always expand and collapse the summary outline later, see Expanding and Collapsing the Summary Outline). 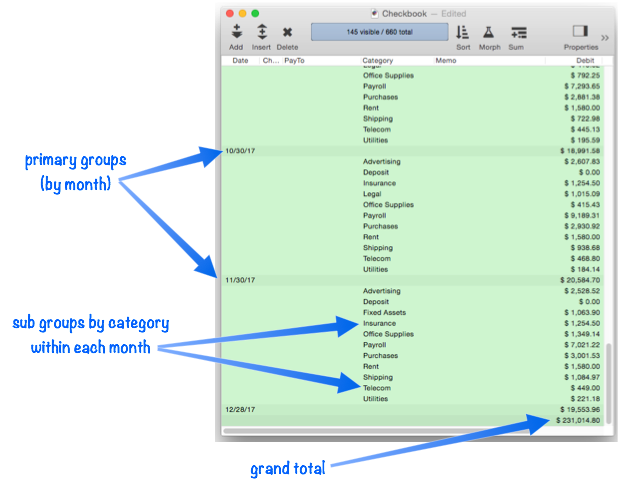 In this example, the primary summary is by month, with the categories grouped within each month. 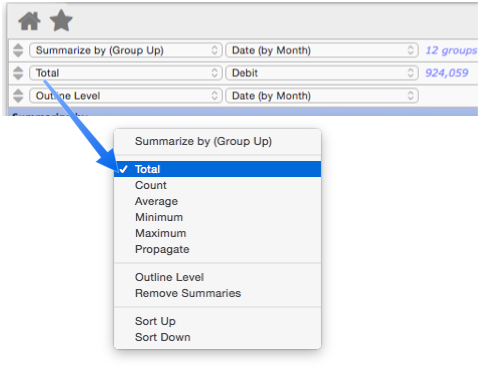 Press the Analyze Data button to create the multi-level summary outline. The summaries shown so far have totalled a single field. However you can also perform counts, averages, etc. and you can also perform calculations on multiple fields. To change the type of calculation, choose from the pop-up menu. To perform additional calculations, click the + button on the right, then use the pop-up menus to choose the type of calculation (Total, Average, etc.) and the field to perform the calculations on. It’s possible to perform multiple calculations on the same field, for example both the total and the average, as shown below. Both calculations will be displayed in the preview (as shown above). However, when you press Analyze Data only the last calculation will appear in the database itself (in other words in the actual database only one calculation can be performed per field). Once you’ve set up the configuration for a summary, you can save it as a favorite if you want to be able to easily use it again. See Summarize & Analyze Favorites to learn how favorites are saved and used. Deleting All Summary Records -- when finished with summary records, they must be deleted. Deleting Raw Data Records -- converting summaries into data. Expanding and Collapsing the Summary Outline -- to see more or less detail. Generating Summaries Manually -- manually generating summary records in 3 steps (Group, Calculate, Outline). groupseq( -- returns the sequence number within a summary level. Printing Summary Information -- printing a database that has been organized into categories with summary records. Running Difference -- calculating a running difference down an entire database column. Running Total -- calculating a running total down an entire database column. Summarize & Analyze Favorites -- saving and recalling favorite summaries. Summary Records -- are temporary records used for calculating totals, subtotals, and other summary information.